Credit card points and cash back offers are everywhere. EVERYWHERE. We regularly get messages asking us for advice about which credit card has the best rewards. We both use credit cards to make all of our routine purchases, in part, for these very benefits. What is the other reason we use a credit card? They provide good protection if someone steals your number and makes fraudulent purchases. So, if credit cards offer so many benefits and are so great, what’s the problem with this? The problem lies in the fact that many of the people asking us for advice about these rewards points and benefits often have a bunch of unpaid credit card debt. Making the minimum payment on a card while carrying a balance month to month is a terrible place to find yourself in. You might be carrying a credit card balance because of a situation you couldn’t avoid. And we get that. Stuff happens. But for people who are earning a living wage or even a high wage and still carry a credit card balance, it’s just a bad look. We both have awesome credit, but we had to work for it. We started working to build our credit as soon as we turned 18. Why? We knew we didn’t want to be poor forever and vowed to learn strong money habits. Surely, with credit scores above 800, we should get awesome interest rates on our credit cards, right? The interest rates on our credit cards vary from a low of 13% to a high of 19%. And it’s not uncommon for people to see interest rates as high as 25%+. The banks don’t care who you are, they’re happy to take money from anyone. Even elite credit won’t get you a good deal. Credit card debt is easily one of the most punishing forms of debt you can have. The most popular credit cards typically offer 1-3% cash back and/or 1-3x points for every dollar you spend. That means if you spend $1,500 during a month with 2% cash back, you’d get $30 back in cash. If, at the same time, you were to have a $3,000 credit card balance, your monthly interest payment at a 19% interest rate, would cost you $47. Easily wiping out the benefit of the credit card points / cash back. 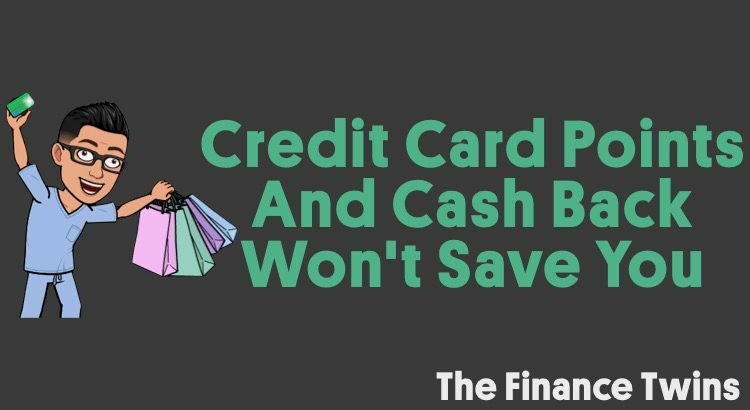 Add in the fact that credit cards lead to more spending (1 study shows that people spend up to 83% more money when shopping with a credit card vs cash), and it’s clear that credit cards aren’t the savior the TV commercials make them out to be. The same goes for Ebates and other cash back programs. If you find that you are spending more money because you’re getting “good deals” you need to cut yourself off. The last thing you want is to get stuck paying back your credit card debt for the rest of your life. It’s almost as if your credit card is the friend in college who invites you to parties the night before a big test. The good news is that if you didn’t procrastinate and already studied, then you can go and party in peace. Personal finance works the same way. Until You Have Your Money Situation Under Control, Credit Card Points Are Not Worth It. So by focusing on how to get the most credit card points or cash back rewards you are simply focusing on the wrong thing. Especially, if you don’t have your finances in order. It’s like living in a house with a roof that’s leaking rain water, and you’re focused on asking which floors are the easiest to replace. Instead of focusing on how to fix and replace your carpet, you need to be patching up the roof to prevent future leaks! 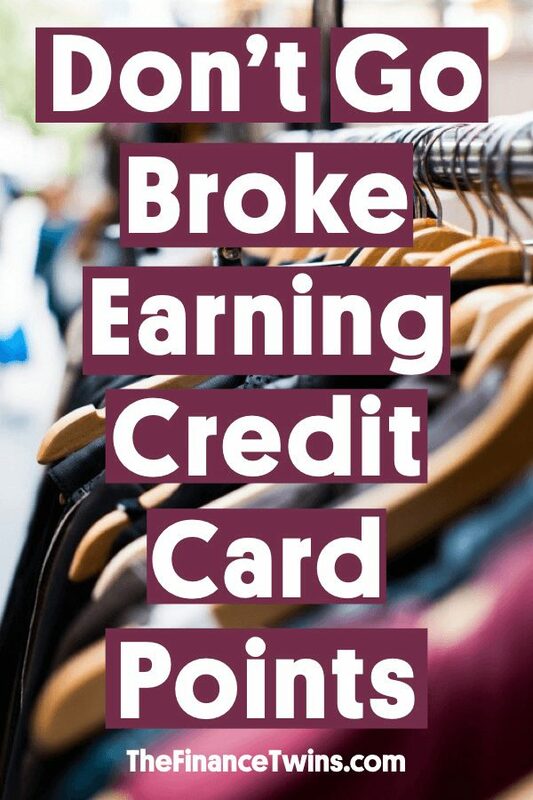 Once your roof is patched up and you’ve got your credit cards paid off, monthly budget set, and are saving enough of your income for retirement, then please do focus on which credit card will get you the most points. But until then, you have bigger fish to fry. One day you’ll be able to use those points to travel and explore the world, but you need to get your finances in order first. Not sure where to start? Sign up for our free Personal Finance Boot Camp Series. Your post is a great outline of important considerations for credit cards; very thorough. Credit card companies are taking advantage of those that are vulnerable IMHO. Managing credit and credit cards can be challenging, but if you master it you can make money using credit cards. Years ago, my wife and I focused on establishing excellent credit long before we ever heard of the term, FIRE. About 10 years ago, we developed a strategy to make money from the credit card companies. We are diligent about it, but it works for us. We make, on average, about $1,000 per year. Over a decade we added about $12,000 to our net worth (compound interest). In a nutshell, we get 1-2 new credit cards every year that offer sign-up bonuses and zero percent interest for at least a year (some offer 18 months zero interest). We max out the cards, save the bonus and cash back money, pay minimum payments (zero interest on statement balance), and invest the money we would pay as the statement balance in online savings accounts or short-term CDs (low risk, 2% interest now). At the end of the year, we payoff the card in full without paying any interest or penalties. We recently signed up for another (LOL) new card last month. Return to us in the first statement is $300; we’ll get over $1,000 on this one card by Sept. 2019. I posted the details on my blog for those interested in learning more – I love making money from the banks! Again, great post and credit card info – thanks. That is awesome! Thanks so much for sharing! Saw this article in the money jukebox. Great job! Yes, these rewards for work for some but not all. I double everyone realizes that “someone” is paying for these reward points (no such thing as a free lunch). Stores pay the CC fees and they are not going to absorb that new cost – it’s simply baked into whatever item is purchased. Plus, as mentioned in your article we typically overspend, on average, when using credit cards. It’s simply a shell game. Hey Tim, thanks for stopping by! So true that the consumer ends up paying for these rewards at the end of the day. The money has to come from somewhere! For sure, the banks make some of the money back on fees. Although unfortunate, the banks make a lot back on those that manage credit poorly and pay the high interest fees when the balance isn’t paid off at the end of the month. The banks know there are a few of us that take advantage of the programs; be the few (the financially educated). Yep, their “best” customers drive the majority of their earnings.